Am flying to Redmond Oregon tomorrow and picking up my Boxster and driving it back here to Georgia. It is a six day trip and hopefully no problems will arise. The dealer has said all fluids have been topped off. I will check that and look for any leaks frequently on the long haul back. I have family in Oregon. Got a good deal on the car and it drove very well when I drove it in Oregon a few weeks ago. Plus there is no sales tax in Oregon and Georgia does not collect any sales tax when I register it here. Any advise anybody might have. ?i have seen a number of posts that recommended that the IMS bearing should be replaced shortly after a used 2003 Boxster is purchased. Any comments about that? Welcome to the forum and congrats on the new ride! Post some photos of it when you pick up the car. The IMS issue is one that is often debated - if your car ends up having a faulty one; things will get expensive. On the other hand, you may replace it and end up not having to since the stock one was fine to begin with - it's one of those preventative issues that you need to decide if it's worth your investment. I'm attaching a link to our site's DIY tech articles on the 986 platform to help you with any future maintenance or repairs. Please let us know if you have any questions. That sounds like a great time driving across the county in your new car. I was thinking about driving one from mid Ohio to Eastern PA but that deal fell through, ~600 miles. I'm a recent owner of a Boxster and I have read this forum a times over. There are many different opinions on the IMS, I was IMS paranoid. I have always wanted a Boxster, saved for awhile, searched for awhile for the right car and just didn't want to think about it so I factored that into my what I wanted to spend. For piece of mind I changed mine right after I bought, 'luckily' I also needed a clutch and flywheel so it was sort of like addressing it when I needed a clutch Anyway, I do not think about it anymore and really enjoy the car. You will have to decide your tolerance for risk. You can be like me and change it right away or wait until you have clutch issues (sort of like me). Then you will get to decide which IMS to use. Hey! Congrats! And by the way: none of this happened unless there are photos! hahaha. LOVE the yellow. Post pics when you can! 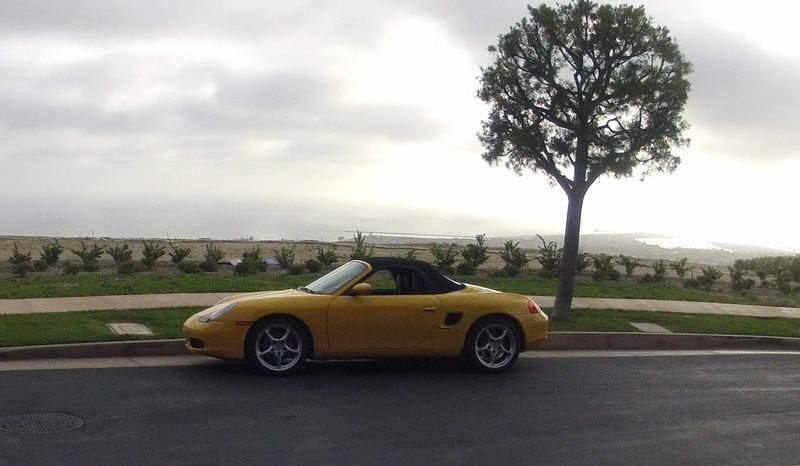 In 2003 I bought my Boxster off E-Bay, flew up to Portland to inspect & pay for it, $33K,15,400 miles.Then drove down the coast back to Manhattan Beach CA. This was the best trip I have ever had. P.S. Yes no sales tax in Oregon & no tax in CA if you wait 90 days after purchase to bring into CA so it was a long lesurly trip home. I had never heard of a IMSB at this time. At the minimum I recommend you have someone remove the oil filter housing & inspect the filter before you buy the car. If it's been more than 2,000 miles since it was changed go ahead & have the oil & filter changed. Last edited by BYprodriver; 08-13-2018 at 09:03 AM. BigDave20 - Congrats on your new Boxster! As a fellow Speed Yellow owner, I must warn you that you will get a LOT of attention around here! The PeachState club is very active and is definitely worth checking out. We have monthly meetings (called Socials) usually the 2nd Monday of the month. The next one is at the Big Ketch in Roswell on Sept 10th. Even if you don't plan to join, stop in and meet everyone - it's a great bunch of people. Georgia doesn't have an auto sales tax, but we do have an "Ad Valorem Tax". It's based on the (states perceived) value of your car. It used to be charged annually, but all car purchases since March 2013 are subject to a one time "once-for-the-entire-time-you-own-it" tax. Instead of paying a little bit each year (which decreased slowly to zero), they now hit you with one big lump sum up front. Again, awesome that you bought the car and are going to drive it back here from there!